Vanilla extract is a solution containing the flavor compound vanillin as the primary ingredient. Pure vanilla extract is made by macerating and percolating Extract Grade vanilla beans in a solution of ethyl alcohol and water. Natural vanilla flavoring is derived from real vanilla beans with little to no alcohol. The maximum amount of alcohol that is usually present is only 2–3%. Imitation vanilla extract contains vanillin, made either from guaiacol or from lignin, a byproduct of the wood pulp industry. 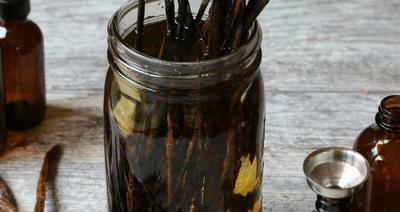 Split the vanilla beans in half along the length or chop the Vanilla beans into smaller pieces to fit jar or bottle. Place the split vanilla beans in the jar and cover with alcohol making sure they are completely submerged. Cover the jar or bottle and shake well. Keep your beans in the alcohol for at least one month in a cool, dark place, shaking it from time to time. Taste the extract and let it infuse longer if you want a stronger flavor. Filter/Strain the extract with a funnel to remove the pods and pack into a pretty bottle. You may also leave the pods in the extract.